English organist, choirmaster and conductor, born June 18, 1956 in Wakefield, Yorkshire, where he became a Cathedral chorister. In 1974 he became Organ Scholar of St John’s College, Cambridge, where for four years he acted as assistant to Dr George Guest (2). His organ studies were with Jonathan Bielby, Ralph Downes and Dame Gillian Weir. On leaving Cambridge, he was appointed Assistant Organist at London’s two Anglican Cathedrals, St Paul’s and Southwark. In 1985 he became Sub-Organist of St Paul’s Cathedral. In 1990 he succeeded Dr Christopher Dearnley as Organist and Director of Music. 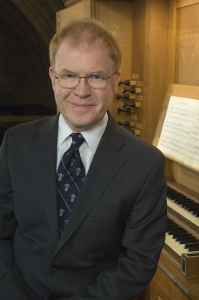 In the summer of 2004, after 26 years at St Paul’s, he moved to take up the post of Organist and Director of Music at St. Thomas Church, New York City, New York, in succession to Dr Gerre Hancock, where he directed the choir of men and boys. He died of a heart attack on August 12, 2015.